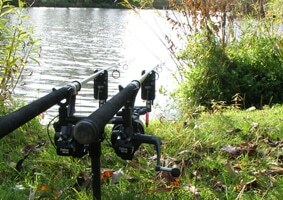 There are very few pieces of carp tackle around which you can genuinely say have stood the test of time, and if you asked a group of carp anglers to name those items, there would be one or two constantly mentioned. I consider the Delkim bite alarm to be one of them, and over my 23 years as a carp angler I am now on my third set. I will admit that a couple of times over the years I have completely fallen for the hype that surrounds some of the other alarms on the market, but it hasn’t been too long before I have come back to Delkim. I’ve had my current set (3 Tx-i Plus heads and an Rx Plus Pro receiver) for just over four years and I can honestly say that up until now they have survived everything I have thrown at them. Unfortunately, for one of the alarms this has included a sudden trip to the bottom of Chad Lakes. However, even after being submerged for a good couple of minutes before I managed to rescue it with my landing net, the alarm fired back up at the first time of asking. Because the Delkims have so many features it’s quite hard to single out the best of them, but two that do stand out for me are the very long battery life in both the alarm and receiver, and the wide sensitivity adjustment. No matter what conditions I’m angling in, being able to adjust the heads to completely eliminate false bleeps is extremely handy, and avoids annoying both me and anyone else that’s nearby. When anyone asks me about alarms it’s now second nature to point them in the direction of what I consider to be the most reliable bite alarm on the market. Sure, they might not be the smallest or lightest around, but to me that’s totally irrelevant with such an important piece of kit. When you pick up a Delkim bite alarm you can immediately feel they are a quality product. British made, built to last and to me seem just about unbreakable.